An appointment is needed to ensure a Confetti Bridal consultant is available to assist you in finding a wedding gown that best suits your personal style. Our consultants can also help select bridal accessories and discuss customization options with you. If you plan to wear a specific piece of jewellery or accessory on your wedding day, please bring it with you to ensure it complements the gown you select. 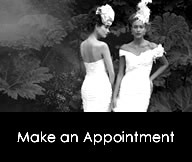 You may also want to bring images of wedding gowns you have seen on our website that you wish to try on. We suggest you limit the guest list to no more than two guests whose style opinion you value. We suggest you order your wedding gown at least four to five months before your wedding date to avoid rush fees, as all gowns are special-order. Select Confetti Bridal gowns are available to rent, or some of our sample gown are available to purchase immediately after your fitting. Ask your consultant for more information. We will contact you once your gown is complete to schedule your first fitting, which takes place three weeks before your wedding day. Two or three fittings are typically required. However, more fittings will be scheduled if necessary. Following your final fitting, we will press and pack your gown to be taken home.